By the last quarter of the 19th century, the use of medallion flags came to a relatively abrupt end. The number of states rapidly, rising from 38 states in November, 1889, to 44 states by July, 1890. Use of the medallion pattern on flags surged during the Civil War and continued through the Centennial Period of 38 stars, but medallions of 44 stars or greater became unwieldy and are rarely found. This flag is one of the last great medallion flags, featuring an exceedingly rare triple medallion. The flag itself is in immaculate condition. With the exception of a single missing tie on the top left portion of the hoist, the flag is in nearly the same condition as it was when made 120 years ago. 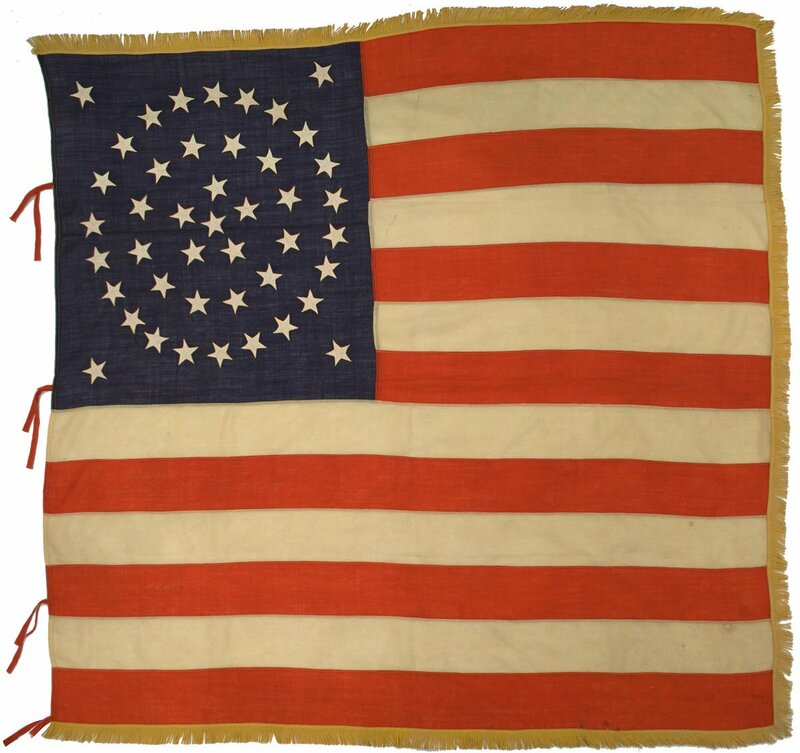 The golden twisted fringe and square proportions of the flag are reminiscent of military regimental battle flags, and in fact this may have been used as a military color. The precision of the workmanship and the style of the flag are sufficient evidence that the flag was professionally manufactured. The flag's cotton muslin stars are expertly machine stitched to the wool bunting canton, and the wool bunting stripes are also machine stitched and very evenly sized. 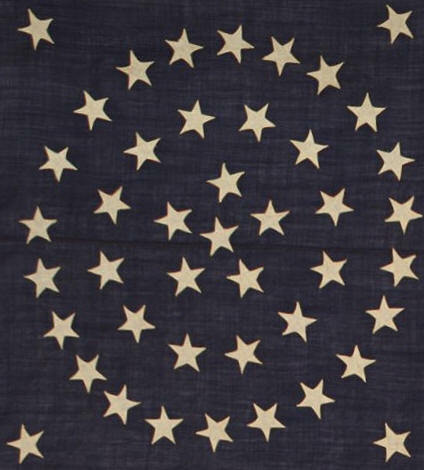 I'm aware of one other flag of near identical construction to this flag with the same pattern of stars and square proportions, formerly in the Thomas Connelly collection (Sotheby's Important Americana, Lot 149). An auction note for the Connolly flag notes that "It's rare to see either a flag of square proportion in this era, or one having a 'medallion' or 'wreath' pattern. This is particularly true for the most rare 'triple-medallion' configuration." "This flag was passed through my family, starting with my great-grandfather, John Hurbert Henley, down to my father, Donald Jim McCandlish. Family history states that this flag flew on 2nd Street in Casper, Wyoming on July 4, 1891. And to think that Custer had fought his final stand less than 15 years before, not much more that a hundred miles away. My great grandpa Henley had traveled to Wyoming, by train with his father to visit family members. When they left to return to Missouri the flag was presented to them. It has always been an important part of my family history. My father and his grandpa were very close and shared pride in this flag and their country. Grandpa Henley passed in his 90's in a nursing home, in Southern Calif. This bit of my family’s western history was one of his few remaining belongings. My father and his fathers before him were extremely patriotic. He served in the military and during that time fell in love with Wyoming as family members before him had. He was stationed on Pole Mountain, close to Laramie and Cheyenne. He was Marketing Director for Bell and Howell in Southern Calif. until 1966. At that time he went for his dream and moved to Wyoming. He was active in the American Legion and was post commander in 1988-89 in Wyoming. Americanism and flag etiquette were his thing. He went on to work for 8 years, as Wyoming State Adjutant for The Legion." Overall, this beautiful flag is one of the most majestic of the last decade of the 19th century and a fitting tribute to the great state of Wyoming and the family that preserved it for generations.